The heart is the wellspring of life both literally and figuratively. When our heart stops beating, we die physically. When our heart stops beating spiritually, we also die. Both deaths result in a ripple effect on those around us. What this country, and more importantly Christians, need most is a heart revival. Our hearts need to be revived to love God and to love others. Christians relying on their strength first and God second is rampant. Christians acting unloving to others is also rampant. We speak “love” from our mouths, but our hearts are not in line with how we act and think. God knows, and other people know, too (Matthew 12:34). Frank Kafka, a Jewish born novelist once said, “The Fathers of the Church were not afraid to go out into the desert because they had a richness in their hearts. But we, with richness all around us, are afraid, because the desert is in our hearts.” Whether we care to admit it or not, our sinful nature can spring up at any moment if we are not careful. When we are spiritually empty, exhausted or complacent, we make room for more of ourselves than for the Holy Spirit. Ever find yourself rushing down the sidewalk to meet someone for coffee or lunch only to find yourself a little put out by the dirty, smelly, and maybe even intimidating homeless person taking up residence in your path? Assuming you are not staring down at your phone or engaged in a phone call during your sprint, what is the first thing your heart says when you see that person? Is it, “Here’s another one.” Or maybe, “Why don’t they just a get a job for goodness sakes?” How about, “I’d love to give them a few dollars, but they are probably going to use it to buy drugs or alcohol anyway.” All those thoughts may be valid, but how often do you acknowledge him or her with a smile, eye contact or a “How are you doing?” No greater conviction comes than when you hear your children saying the things your ugly heart mutters under its breath. If words have the ability to speak death or life (Proverbs 18:21), we need to work on being better speakers of life. And often, our actions speak louder than our words. I believe God needs a heart revival in the Christian world before we can do a better job of reaching the world. God knows our heart even more than we know our heart. He knows what we think before we speak or act (Psalm 139:2). Christians today are doing a better job at tearing down the witness for the Gospel than those who claim to not believe in God at all. Jesus had a name for these people who act like this. He called them hypocrites. Merriam-Webster defines a hypocrite as, “a person who puts on a false appearance of virtue or religion and a person who acts in contradiction to his or her stated beliefs or feelings.” When we say God is love and that Christians are made in the image of God and New Testament believers are filled with the Holy Spirit (whose fruit includes love), but we aren’t acting like love, we are hypocrites. It is plain and simple. It may sting a little to hear these words, but correction isn’t always pain-free. If your heart is reacting to these words right now, a spirit of conviction may be at work. I desperately want to be the person who loves everyone without hesitation or judgment. It is a real struggle, if I am completely honest, to think like Jesus first. When I see a person who looks different than me, what is my first thought? Is it Jesus filtered first and foremost? Instead of judging outward appearances or actions, I really do want to be like Christ who goes straight to the condition of a person’s heart. And you know what? You and I can be like this because we have the Holy Spirit within us. When we rely on the strength and the power of the Holy Spirit in us, we gain wisdom, discernment, empathy, and love that our human hearts can’t do on their own. God needs to transform our hearts radically. Far too many are wavering in the waters of lukewarmness toward God and others, and we are creating collateral damage for His bride. When non-believers act more kind and moral than those who claim to be Christians, it hinders the potential to reach that person with the Gospel because to them, why would they want to become unkind, unloving and less moral in order to become a Christian? At the opposite end of the spectrum, if someone is acting foolish and living a life riddled with sin and ungodliness, and they see a Christian partaking of the same foolishness and sin, why would they think they need to do anything different? It’s hard to speak about eternity when we are earthly minded people unless the goodness of eternity has overwhelmed and wrecked us so thoroughly that we can’t help but to live like Christ and for Christ. At your annual exam, or anytime you visit a doctor for that matter, the doctor always listens to your heart because what’s going on in your heart helps them understand what might be going on with the rest of your body. It is the same spiritually. If we are willing to let God exam our hearts, what would He find? Even if you think your heart is in great shape, it still needs to be exercised and trained. There is always work to do in our hearts. To revive something means “to restore from a depressed, inactive, or unused state.” We as a people need God to revive our hearts again toward loving Him and others. We need to replace the deserts within our hearts with flourishing gardens of fruit and fields ripe with harvest. But He needs us to want to. If a person revives an old, antique car to its original state but never takes it for a spin outside of its garage, the revitalization is for not. The vehicle might work and have potential, but it will never get the opportunity to be used for its purpose. 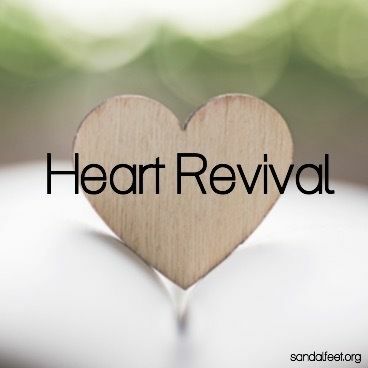 Church, we need God to revive our hearts. We need to beg Him to revive our hearts so that the stuff of ourselves will flush out and make room for the Holy Spirit to overflow within us. We need to want to be pure vessels for Christ to reach those who need to know their Father. May the Potter’s hands perform a work so great throughout the Church that a spiritual marker is set which will produce a massive generational heart revival not only among non-Christians but also among those claiming to be Christians.